Not Mushrooms and Not for Your Risotto | Marlene Samuels, PH.D. In the American west, fall and spring are serious mushroom-hunting seasons, and especially in Southeastern Idaho. Wild morels can be found throughout damp forests — often are substituted in America for Italian porcinis. When not available, home chefs generally resort to substituting with a wider range of domestic cultivated fungi such as button mushrooms, portobellos, shiitakes, plus a host of others, the names of which I can’t remember. And let’s not forget those coveted and shockingly pricey truffles imported from Europe and now, even from parts of Asia, that appear in fall and spring. However, regardless of a multitude of precise guides available to hunting wild mushrooms — complete with fabulous photographs and detailed descriptions that will lead us to identifying and collecting edible ones, I’ll stick with mundane, cultivated varieties, store bought, thank you. Occasionally, I wander outside the neighborhood into Italian Gourmet Food shops where I’ll splurge on something a bit more exotic, imported, and costly. 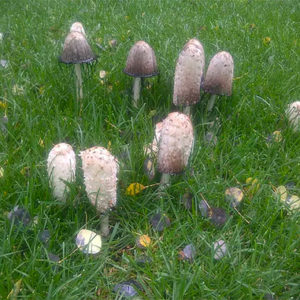 Agarics is a class of fungi that contains thousands of varieties but, regardless of just how much they resemble edibles, usually are suspected of being poisonous. After taking a few photos in Idaho of strange yet beautiful fungi, and intrigued by the eerie, extra-terrestrial looks of these lawn decorations, I moved on to another one of my favorite non-cooking activities — research. Siddhartha Gautama (A.K.A.The Buddha): It’s believed that Gautama died of mushroom poisoning some time around 479 BCE but this claim has come under a good deal of debate. Roman Emperor Claudius is believed to have been murdered by being fed the death cap mushroom. This story appeared approximately two centuries after the event amidst controversy about whether he was, in fact, murdered or the unfortunate victim of an unfortunate gastronomic choice. Pope Clement VII is rumored to have been murdered by mushroom poisoning as well. Again, a great deal of debate surrounds the conclusion. And, for more daring gourmets, stay tuned for my soon-to-be published collection of essays.